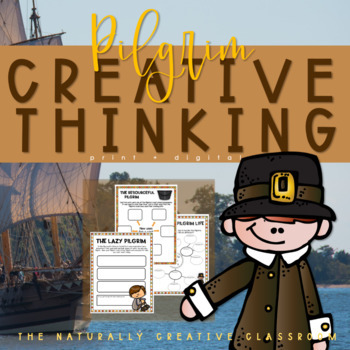 20 Pilgrim themed creative thinking, writing and math activities for Thanksgiving. This packet is geared towards 3-5th grade, but could be used to challenge more advanced 2nd graders. These Pilgrim activities may be used individually or stapled together to create a pilgrim packet (black line cover included). Great for centers or Early Finishers! Fostering creative thinking has been shown to increase learning in all areas. -Living the Pilgrim Life-How would your life be different if you were a Pilgrim? -Pilgrim Problems- What were 5 disadvantages that the Pilgrims had when sailing on the Mayflower? -The Resourceful Pilgrim- The cast iron pot was one of the Pilgrims most prized possessions. What are 5 other ways a Pilgrim could use a cast iron pot? -Who are "The Pilgrims”- Write questions that have the answer of "The Pilgrims"
-Sinking Fast- You are a Pilgrim child and dropped your toy into the ocean. You have to get it back using only bread, a hat and some string. Tell how you would do it. -Keeping Track- You are a pilgrim child and you want to count the days you have been in the colony, but you don't have a paper or a pencil. How else can you keep track of the days? -The Mysterious Deer- A deer shows up in the middle of the fenced Pilgrim village. How did this happen? -Pilgrim Poetry- Write an acrostic poem with the word "Pilgrim"
This Pilgrim Packet contains a Product Descriptor for easy grading! 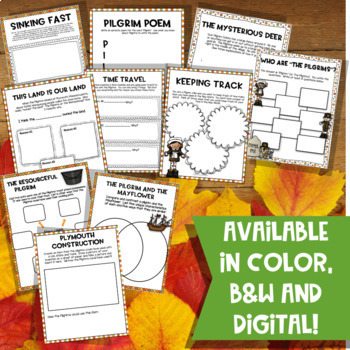 Sample Answers included in this Thanksgiving Pilgrim packet to get you and your class thinking! 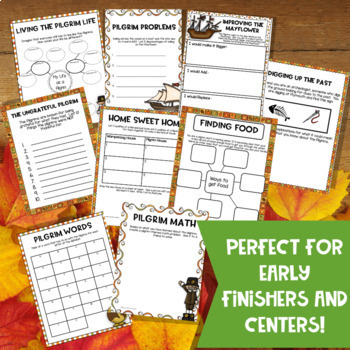 This makes a great Thanksgiving early finishers packet as well! Use them as sponge activities to get your students thinking. Do you have a student who needs enrichment? Make this Pilgrim Pack an independent study unit. 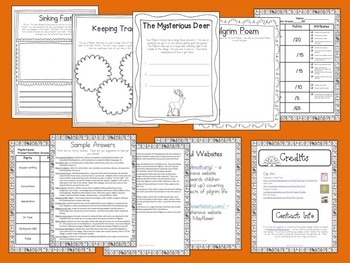 Create Pilgrim themed centers by offering a selection of Pilgrim and Thanksgiving books.